A week's ferry chasing on the ERT fares saw us through Moidart, Knoydart, Skye, Harris and Lewis, ending up in Ullapool. 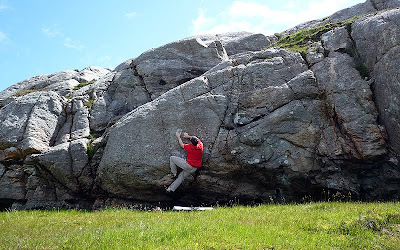 It was good to see Harris getting some bouldering attention, especially Aird Mighe, which is a terrific venue on the Golden Road, where it is almost impossible to keep your eyes on the road as you wind from Tarbert down to Rodal. I suspect there are some superb gneiss roofs hidden in this wilderness of water, light and rock. A walk through the vastness with binoculars and tent is a must for the next visit, though I am conscious that once in this eye-level maze, I might never come out again! A new topo for the accessible Aird Mighe can be found on Scottish Climbs, I managed the excellent short roof problem of Crystal Voyage, which feels hard in the summer heat as the ultrabasic crystalline nature of the rock makes it a bit soapy. 6c in winter I'd say, but you'd probably not want to be here in winter, unless you have tent pegs to stake out your mat and tarp. 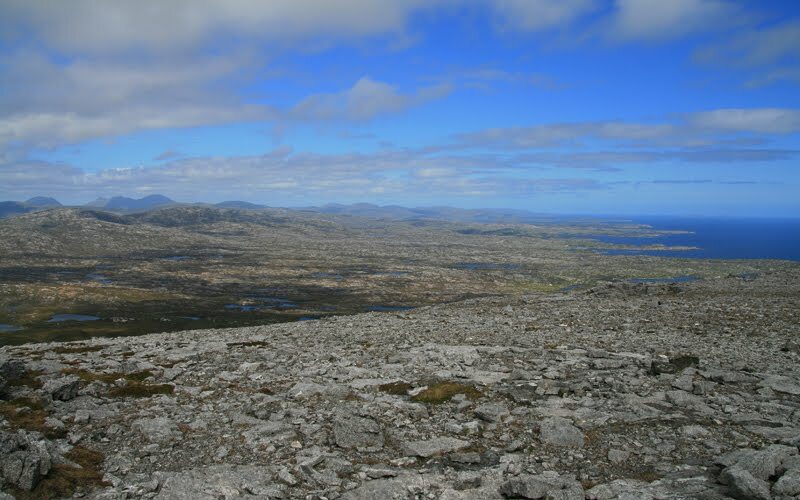 The crag is typical of Harris: a rounded barrel of glaciated gneiss, but what makes it attractive to the boulderer are the undercut roofs that lead out to the walls. In Ullapool, Ian Taylor and friends have been busy developing new routes and bouldering all around Coigach. Ian has produced an excellent new booklet guide to Ullapool New Routes, including the excellent technical bouldering at Ardmair, new routes at Rhue, Reiff, Ardmair and Rubha Dunan. 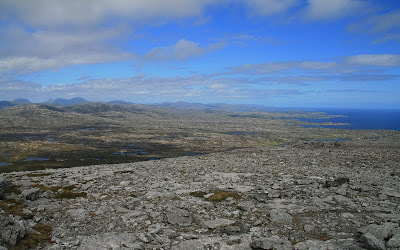 The superb photo-topo booklet is a worthwhile addendum to the SMC Northern Highlands North. You can buy a copy in Ullapool's only real Outdoor shop at Northwest Outdoors (opposite the post office and beside Costcutters) , as well as Ian's Ullapool Bouldering guide. Not to everyone's taste, this great little crag is a little mossy and north facing (dank in winter, midgy and humid in summer), but it does have a selection of fine technical boulder problems. 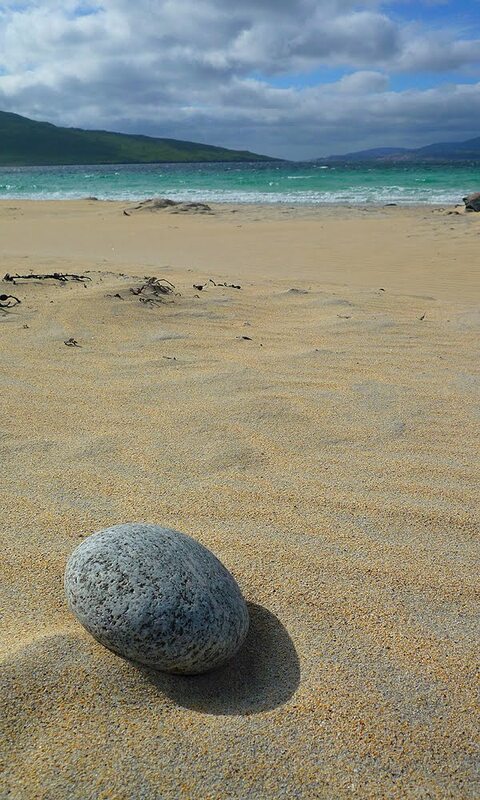 It is one of my favourite spots when conditions are right, such as in June this year, when the long dry spells crisped the moss off the rock. 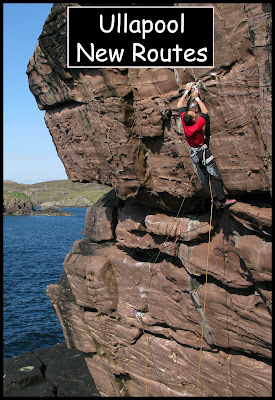 I've put a PDF guide on the Boulder Scotland website, or click on the link below and print out. Unfortunately the humid July rains have returned the crag to a slippy, mossy jungle, best wait for the weather to dry again before a visit.